The day of January 20, which will live forever in our memory, became not only a tragedy, but also a symbol of unshakable will in the name of national independence, freedom of our people. January 20 was the first test and moral victory on the path leading the nation to independence, the restoration of national-spiritual and religious values. Azerbaijani people, subjected to punitive measures of an army armed to the teeth, did not break, did not lose their determination to independence, on the contrary, their righteous voice sounded even louder. Despite 29 years have already passed since this tragic event, the day like the reel of film still scrolls in front of eyes of witnesses: anxious Baku, bullets glittering in the darkness, tanks and hum of armored vehicles, dead bodies scattered through the streets, hospital wards filled with hundreds of wounded. 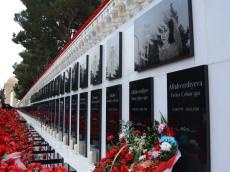 Azerbaijan honors the memory of victims of the Black January events every year. The reasons leading to the January tragedy go deep into history, beginning from the territorial claims of Armenians against Azerbaijan. Due to the aggravation of the Karabakh conflict, a national movement grew in Azerbaijan, the situation in the country became tense, the Popular Front of Azerbaijan (PFA) was created. For this reason, USSR troops numbering more than 20,000 people, entered Baku on January 20, 1990 at 00:20, with the aim of preserving the power of the Communist Party in the country. The operation received the code name "Strike". The Soviet army, without declaring a state of emergency, began military operations against Azerbaijan on the night of January 19-20, 1990. As a result of the military rally, 132 people were killed, including 117 Azerbaijanis. As many as 744 people were seriously injured, four were missing, 400 were arrested. After declaring a state of emergency, 21 more people were killed in Baku, 26 people were shot in Neftchala and Lankaran. The operation was carried out under the command of the USSR Minister of Defense Yazov, by the forces of the Ministry of Internal Affairs and the USSR State Security Committee, as well as regular units of the Soviet Army and Navy. As a result, in protest, several hundred cadets of various nationalities of the Baku All-Arms Higher Military School revolted, seizing part of the Salyan barracks with an ammunition depot in the central part of the city. All the dead and missing in that Black January were named "Shahid of January 20" in accordance with the decree issued by Azerbaijani President Heydar Aliyev in 2000. Crowded processions of Baku residents took place in memory of innocently executed residents of the city On January 22, 1991. The victims of the tragedy were buried as heroes of the struggle for independence in the park named after Kirov, which was later renamed the Alley of Martyrs. In commemoration of the Black January events, the Baku Metro station called “The 11th Red Army” was renamed “January 20”. "Black January" is forever inscribed in the country history as a day of heroic struggle in the name of the freedom and territorial integrity of Azerbaijan. The day that led to serious losses and the killing of innocent people demonstrated the readiness for struggle, the pride of people who could not bear the policy of the USSR leadership treacherous towards Azerbaijan, raised their voice to gain freedom and independence.